I rented an XRF to analyze two antique swords I own. I also included two other swords that I forged myself from meteorites. I've provided the raw data below. The results were pretty interesting and I'm curious what some of you think - especially anyone with a metallurgy background. 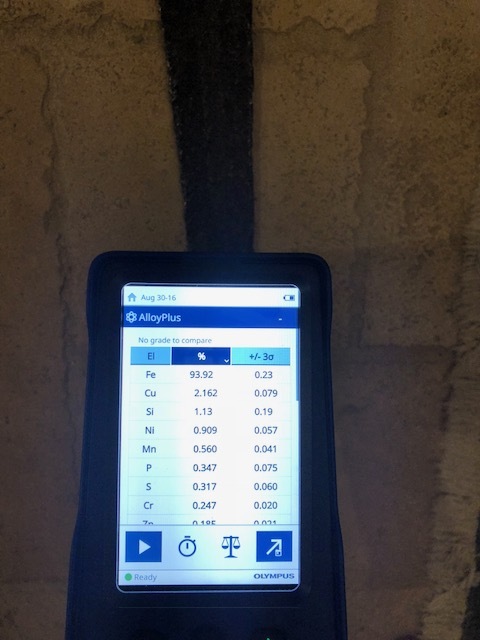 I first tested the XRF on some known metals just to confirm its accuracy and repeatability, and it was very accurate and very repeatable. I tested stainless steel, aluminum, and carbon steel. It should be noted that this test doesn't date the metal, however it should show if the steel is a modern day iron or bloomery iron. It's certainly possible someone could make their own iron and then process it down and forge it into a sword and then artificially age it, however as a bladesmith myself, I would find that very hard to believe. Making your own steel out of dirt is a major undertaking and then trying to forge that bloom into a bar and then a sword would be tough. A faker would buy bar stock and start the forging process from there. The first picture shows the four swords. The two on the left are the meteorite swords I forged. They were both major projects and took months to complete. Forging meteorite is not easy and it actually took a couple of years to get the process down. They are 100% meteorite iron. The XRF results back it up. The third sword is a Viking Age sword I bought from an antique arms dealer last year. I have always been very confident in it's authenticity. The XRF results also back this up in my opinion. A modern day iron would not have Sulfur and Phosphorus levels this high. Also there is pretty much zero Manganese, a modern day iron would have much higher Manganese. The Silicon levels seem high too. In addition the composition varies as you measure up and down the blade which would probably not happen with a modern day iron. The fourth sword is a Medieval Age sword I recently bought on Ebay. I knew I was taking a big chance with it. When I got it it sure seemed real to me, but then I found a thread in this forum with other swords sold on Catawiki that appeared to be very similar to mine and the consensus on that thread was that they are modern day fakes. That made me think mine is probably fake because they seem so similar. The XRF results were very surprising in my opinion. The Sulfur and Phosphorus levels seem too high to be a modern day iron. The Silicon levels seem very high too. The most surprising thing in my opinion is it has 2% - 3% copper depending on where it was analyzed. I've never heard of steel with that much copper. I just don't see how this could be a modern day iron alloy. That being said I'm not a metallurgist. I'd love to get your opinion on these results - especially with the Medieval Age sword. Thanks!!! Cu also improves the corrosion resistance of stainless steels. An alloy containing 20 % Cr (chromium) and 1 % Cu has good resistance to nitro-sulphuric acid and has therefore been used in the manufacture of explosives. Steel containing 16 % -20 % Cr, 1.0 % – 3.0 % Si and 1.0 % – 2.0 % Cu is resistant to sulphites and is used in the pulp and paper industries. I scrubbed the hell out of one section with hot water and soap with a bristle brush. Wire brush might be too damaging. Anyway the P and S levels stayed the same. Here’s another pic. I’ll be going to work in a little bit but I’ll bring the XRF and sword, so any other ideas please let me know. I need to ship the scanner out later today. Cant help wonder if that high Cu and a little Zn content might be a byproduct of cleaning off rough material with a brass wire brush. Nope - I used a plastic scrubbing brush, so no brass at all. JG - thanks for the input. I would think the brush I used this morning along with the soap and hot water would have gotten any remnants of previous items used on the iron. Maybe I'm wrong, however it seems like any brass from a brush would have come off during that process. I scrubbed several times over 20 minutes in one area and it didn't change the copper results from the scanner at all. I'm not trying to discount your thoughts, I just don't think it's the case. Interesting findings. The number and quantity of alloys in the second "old" sword would give me pause if I saw this listed in the description. XRF can have some solid info but I have seen some weird things as well over the years. I fear my knowledge base does not go deep on this kind of thing but have spent time studying it and the like for quite a while. Does the number just under the edge of the reading indicate Chromium? Thank you for the reply. Yes that is Chromium down on the list. It was coming in around 0.25%. I know in stainless steel it's about 50 times as much (around 12%), so not sure if it could be a trace element in iron ore. I think it might be in regular steel too to a much lesser extent. To be honest I just don't know. It would be really cool if someone had chemical composition results from other known medieval age swords just to see what's possible in authentic antiques swords from this period. Not sure if chromium occurs naturally in most iron ores. If not it could move the needle back to being a fake. I just can't get over the really high sulfur and phosphorus levels. I don't think there is any modern day steel that would have those type of readings. It would be really cool if someone had chemical composition results from other known medieval age swords just to see what's possible in authentic antiques swords from this period. ...examined with a PV 9800 X-ray fluorescence spectrometer. In result of the chemical analysis the following composition of the steel was obtained: Cu c. 80.4 ppm, Ni c. 70.5 ppm, Pb c. 39.2 ppm, Cd c. 0.104 ppm. 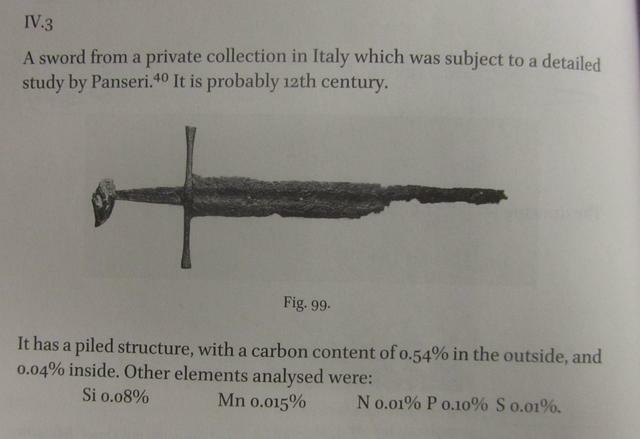 This corresponds to the chemical composition of already examined samples from medieval Tuscan weapons and no admixtures which are typical for present-day steels were found. This demonstrates that the blade was forged from bloomery steel with increased phosphorus contents. Increased contents of Si are perhaps related to numerous slag inclusions in the surface of the blade. The contents of other elements corresponds to those discovered in other bloomery iron items from the same period as the Szczerbiec. Concerning a sword from the collection of the Castle of Golub-Dobrzyń...Concerning the chemical content of the metal, attention is attracted by a very high content of copper (0.17-0.19% Cu), which may be related to the use of scrap steel in the smelting processes. A high content of nickel in the cutting edge (0.21% Ni) is also noteworthy. On these grounds it was proposed that the sword was a 19th c. replica. The case of four swords from private collections in Szczecin was similar. It was found out these swords had undergone procedures which had been supposed to provide them with “antique” features. Concerning their chemical content, a very high proportion of copper, manganese and chrome was found. The last sword, from a private collection in Sanok and of a putative 13th c. date... the chemical analysis demonstrated a high content of copper (0.25-0.29% Cu), chrome (0.02-0.04% Cr) and manganese (0.43-0.54% Mn). Therefore, this sword was considered to be of a 19th c. date as well. I have a colleague I worked with at Brown University, who is an XRF/Materials specialist. I will give her a ring in the morning (US Eastern time) and see if she has any input. If you have to return the XRF machine, I would advocate taking as many readings from different areas as possible. Disclosure, I am not a metallurgist. So, the brazil nut pommel sword in question.... what would be the date of such a sword, if it were real? 12th, 13th century? Looks like a Type XII blade, but with a hilt most common on the 11th and 12th centuries (but not out of the question for 13th? That would suggest the use of bloomery steel if the sword is genuine. Of note, It seems the results of the XRF would back up that the Viking sword is consistent with bloomery iron/steel. The Type XII(?) however is more interesting. The Phosphorus content is consistent with bloomery steel, but the paper points out that copper and nickle are usually only present in trace amounts, or in higher concentrations only locally. So that looks suspicious to me. Anecdotally, I am aware of forgers is some parts of Europe buying up 19th century (and older) scrap iron and using that to create forgeries in order to mimic older metals, But (again, anecdotally), I understand that such scrap often includes bit of other metals that were used ornamentally, but are not recognized by the forgers due to corrosion. I remain skeptical of the Type XII, but the Viking sword seems legit. Mark - Thanks for the info with the chemical composition with other swords. That is some great info. I still can't get past the high sulfur and phosphorus levels. Steel made in the last 200 years shouldn't have it. But you're right about the copper. Maybe it is scrap metal that had copper melted in, but that seems like a stretch to me, but who knows. Hadrian - That would be cool to see what an XRF/Material expert would say, especially from an Ivy League! Please let us know. This might close the case. Michael - I agree the results seem weird. Hi S and P indicates bloomery iron and not modern day iron production, however the Cu levels don't seem like they would be associated with bloomery iron, unless it was in the iron ore which is a possibility. I don't know of any modern day alloys with that level of Cu though. Sulfur: Modern day (last 200 years) shouldn't have sulfur in it. Sulfur is pretty much always undesirable, and the steel industry figured out how to get rid of it a couple of hundred years ago. Moves the needle to bloomery iron. Phosphorus: Most modern day steels have little to no phosphorus. It is also usually very undesirable, and the steel industry figure out how to get rid of it a couple of hundred years ago. Moves the needle to bloomery iron. Manganese: This is added to pretty much all modern steel. It is very beneficial to the mechanical properties and is cheap to add so modern steel pretty much always has it. The Brazil Nut Sword has Mn which you would expect to find in a modern steel, that being said bloomery iron could have it as well I believe if it was in the iron ore. Maybe moves the needle a little bit to modern steel. Chromium: This is the primary element along with Ni to make stainless steel. It would be at around 12% for stainless. The Brazil Nut has 2 orders of magnitude less, so very little. I'm not sure if regular iron ore could have a little chromium in it. If iron ore pretty much never has chromium then this would move the needle to modern steel and this being a fake. If it is found in iron ore then it doesn't help the case either way. Copper: This for me is the most confusing. Modern day steel does not have this level of copper. I don't know of any alloys with 2.5% copper. On the flip side, if copper is never in iron ore, then this would move the need to this being a fake. The scrap metal hypothesis could explain copper. If I was going to make a fake sword though and forge it myself I would choose a more "forgeable" steel. Not sure how this moves the needle, but I think it could be very relevant in coming to a conclusion with a metallurgist input. Silicon: This was very high in the scans. I know that most steels do not have this much silicon, although it could definitely be in bloomery iron. There are some 9XXX AISI Steels that have this level of silicon though, so I think you could say it could go either way. That being said, the 9XXX Steels do not have Copper and aren't as common. Ni and Zn: Both can be used in steel production and I think both could be in bloomery iron, although I could be wrong. I just don't know the levels. Not sure if this moves the needle either direction. Probably beating this horse to death, but if that brazil nut sword is fake I might as well get some entertainment out of it. This is a really interesting thread, thanks. Copper is added for bridge steels and some outside architectural projects, but usually less than your levels. There were some limited manufacture steels in the US with 3% copper and some in Russia. Thank you very much for the reply. I really enjoyed the NOVA special you were featured in. It's an honor to have your input on this topic! I do bladesmithing myself using meteorite iron (made a Viking Sword and Long Sword purely out of Meteorite). I even made crucible steel out of meteorite iron after watching your show, however it kept cracking when forging because I think the high nickel content along with the carbon that was added made it too brittle. Sorry for the side track, it's just cool to talk to you. The copper is definitely odd, I found some Polish and Russian alloys as well with Copper using a pretty cool alloy search engine, but like you mentioned at different levels and it definitely did not have some of the other elements that showed up. Not sure if Copper could end up in bloomery steel or not (if not it's definitely a fake). If there weren't such a high Phosphorus and Sulfur level I think I would be convinced it's a fake. I'm not saying it's legit, I just can't explain the P and S levels. I continue to be fascinated by this subject. I found reference to some High Strength Low Alloy steels that can have higher copper content, but they are typically lower in carbon. Do you know how much carbon is in that metal? Not sure if Copper could end up in bloomery steel or not (if not it's definitely a fake). This is completely anecdotal, but last summer I heard a smith telling about his experiences with bog iron. Basically, he had found a deposit of limonite from a marsh on his relatives' lands and tested purifying it with a bloomery. He told that he had the end result tested, and that he was surprised to hear that it contained a significant amount of copper in it. I don't remember how much copper there was exactly, but I have vague recollection that it was a couple of percents. Unfortunately I do not know the carbon level. It's too light on the periodic table for an XRF to measure. Not sure how to get it other than some sort of destructive test. That is very interesting about the copper in the bog iron. If there really was some copper in the bloomery iron it keeps the door open that this medieval sword being legit. Is there any chance you could reach out to that smith to see if they could get you the Cu content? The vast majority (99% or more) of modern day iron does not have copper in it above 1%. There is also virtually no phosphorus or sulfur in modern day iron above 0.1% (especially sulfur). 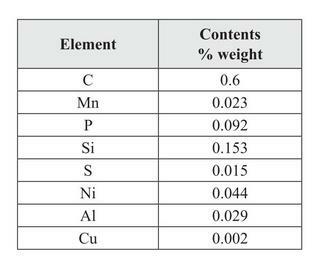 Lastly, Silicon is also not at the levels I saw with the XRF in modern day iron production except for some very specific steels (92XX's but those have no copper and no sulfur or phosphorus). The presence of high S, P, and Si point to bloomery iron in my opinion. I don't know what the high copper points to. I try to put myself into the shoes of a faker of antique arms. If I'm in Poland or Russia or wherever and I'm planning to forge a sword and then artificially age it, I would start with a medium carbon steel bar and forge it into a blade and then forge the cross and the pommel. then you would have to age it by some sort of acid or electrolysis process. That whole process would consume a good bit of time. I find it hard to believe someone would add the step of making bloomery iron and then forge a sword from the bloom and then age it. Adding the bloomery iron step would add A LOT OF TIME, and it would increase the chance for failure because of the lower quality iron which is a result of high phosphorus and sulfur which creates hot and cold short issues when forging. Making bloomery iron seems like a lousy way to make it a profitable venture. I know I'm a little biased because I want it to be the real deal, so I'm trying to keep that in perspective as well. Thanks again for everyone's feedback. Please keep it coming!! !